Child Talk: Talk to Your Toddler…Just Not in Toddler Talk! Everything you wanted to know about your child's speech and language...from the perspective of a pediatric speech-language therapist. I’ve written a lot about the power of talking to your toddler. I’ve shared how techniques such as parallel talk & self talk and expansion & extension can be used to help your child’s language grow. I’ve discussed how indirect language facilitation has been proven to be an effective means of language intervention for toddlers and preschoolers and how parents are every bit as able to provide this type of language-rich environment for their child as speech-language pathologists are. And I’ve explained how the language you use around your toddler and preschooler should be just a bit above his/her current language level. But, I haven’t yet discussed some of the emerging evidence about telegraphic speech - and how that evidence suggests we should be careful about how toddler-like we make our sentences when we talk to our toddlers. Telegraphic speech occurs when we speak like we would in, well, a telegraph. In other words, we omit the “small” words that make a sentence grammatically correct and include only the important words - mainly nouns and verbs. Examples of telegraphic speech include: “put in box” “doggie run” or “mommy feed baby” (Venker & Stronach, 2017). In each of these utterances, the grammatical aspects of the sentence were left out. DO use short but grammatically correct sentences: The cat is running. Why would we be inclined to use telegraphic speech at all? Many of us (myself included) might mistakenly believe that it’s easier for a child to imitate telegraphic speech, especially when they are just starting to use two-word phrases. A child’s use of telegraphic speech is totally normal and actually a really important stage of language development. Around 18 months, children learn that they can create two-word phrases (mommy go; puppy drink; more milk); in doing so, they’ve begun to harness the true power of language. When we combine words into phrases and sentences, we create meaning that the words by themselves can’t convey. And when we learn that we can do this, the possibilities are endless! Because that move into two-word phrases is so important and very normal, adults might choose to model those phrases for children, hoping that the child will imitate those two-word phrases. I know that I’ve done this as a pediatric SLP. However, recent research suggests that children are no more likely to imitate telegraphic speech than they are to imitate grammatically simplified utterances (Bredin-Oja, S., & Fey, M., 2014). So why is it important to avoid telegraphic speech? Mainly because children learn language by hearing language. One of their main jobs during early language development is to figure out the rules that apply to language that they are learning. When, for example, do we put “the” before a noun and when do we put “a” before a noun? When do we put “ing” on a word instead of “ed” (walking vs. walked)? Every language has these rules and every new language learner has to figure them out. Children do that by primarily by listening (which, I might add, is amazing. But I digress...) So, the theory goes, if we use telegraphic speech, we’re taking away essential input that children need to learn the grammatical aspects of language. Recent research seems to support this theory, especially for children who struggle to learn language. One recent meta-analysis (a review of a bunch of studies) looked at parent-child interactions of children with language delays or disorders. The researchers found that parents who used more grammatically complex utterances with their children had children with more positive language outcomes (Sandback, & Yoder, 2016). This was especially true if the children had an autism spectrum disorder (Sandback, & Yoder, 2016; Venker et. al 2015). It’s worth noting that not all experts in the field agree with this opinion (Van Kleet et al., 2010). It’s also really important to note that the research I discussed above has been completed on children who struggle to learn language, not typically developing children. At this point, I’m not aware of research that has looked at the impact of telegraphic speech on children who are learning language well all on their own. However, the rationale behind the recommendation to avoid use of telegraphic speech as an adult might still apply to typically developing children: children need to hear the grammatical aspects of language to learn those elements! 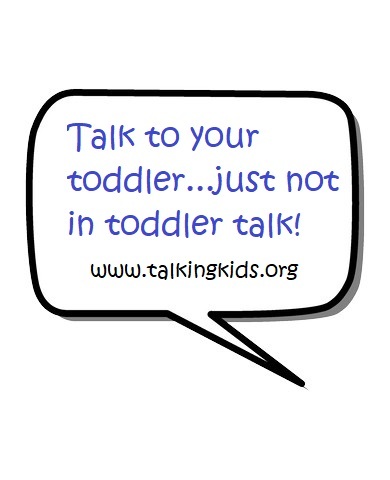 So, whether your child is developing typically, is a late talker, or is a child who struggles more significantly with language learning, my suggestion would be this: Talk to your toddler! Just maybe not in toddler talk. Bredin-Oja, S., & Fey, M. (2014). Children’s responses to telegraphic and grammatically complete prompts to imitate. American Journal of Speech-Language Pathology, 23, 15–26. Sandback, M., & Yoder, P. (2016). The Association Between Parental Mean Length of Utterances and Language Outcomes in Children with Disabilities: A Correlational Meta-Analysis. American Journal of Speech Language Pathology, (25): 240-251. Van Kleet, A., Schwarz, A., Fey, M. Kaiser, A., Miller, J. & Weitzman, E. (2010) Should we use telegraphic or grammatical input in the early stages of language development with children who have language impairments? A meta-anlaysis of the research and expert opinion. American Journal of Speech Language Pathology, 19 (1): 3-21. I would like to personally congratulate you as your blog Child Talk has been selected by our panelist as one of the Top 75 Speech Therapy Blogs on the web. I personally give you a high-five and want to thank you for your contribution to this world. 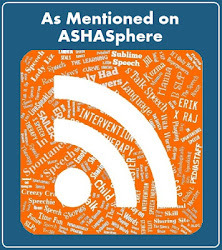 This is the most comprehensive list of Top 75 Speech Therapy Blogs on the internet and I’m honored to have you as part of this! This blog is meant to provide general information about speech, language and communication development only. It is not intended to, nor could it, take the place of the advice and/or intervention from a physician, speech-language pathologist, or early childhood provider who has evaluated your child in person. It is not speech-language therapy, nor is it a professional assessment of any child's speech and language skills. The views expressed in this blog are my personal views and they do not necessarily represent the views or opinions of my employer. I accept cash and product compensation for some of the posts on this blog, and if you click on an advertising link or purchase an advertised product I have placed on my blog, this will sometimes result in a monetary compensation for me, which I use as a means of supporting Child Talk. (Trust me, it's much less than you imagine it to be!). However, my opinions about the products I blog about are my own. (And now back to regular programming). Should I be worried about my late-talker?